Does the Chicago area lack a “vision” for its expressway system? Will more tollways or so-called “managed lanes” be part of that plan? Yes, says the Chicago Metropolitan Agency for Planning, a low-profile public agency responsible for broad-scale land use and transportation planning decisions across the seven counties of Northeastern Illinois. That vision, CMAP says, “will chart a bold, long-term course for the region’s expressway system” to guide future projects and spending by the Illinois Department of Transportation and the Illinois Tollway. For too long, CMAP says, the Chicago area has struggled to maintain and modernize its expressways “in the face of persistent funding gaps” and growing congestion. Delays cost the region $7 billion a year in lost productivity and fuel. New ideas and a fresh approach to mass transit are needed. In announcing the project Thursday, CMAP Executive Director Joseph Szabo said the planning agency was asked by the heads of IDOT and the Tollway to take a “more comprehensive and holistic” approach to the region’s highway management and planning. Second, to enhance operations with “game-changing” mass transit improvements and preparing for automatic vehicles and new communication technology. And third, to better manage environmental impacts, including using expressway right-of-way for things like storm water management, utilities and communications. So what, precisely, is CMAP talking about? Using tolls to raise revenue and manage congestion, for one thing. “The vision will include a financial strategy. Expanded tolling is expected to be a part of that strategy,” CMAP said in the announcement. The Illinois Tollway system is flush with cash and has been growing rapidly for the past six years. A series of toll hikes on cars and trucks since 2011 has been paying for a massive $12.1 billion expansion and rehab program. So far, the program has rebuilt I-90, and converted the Elgin-O’Hare Expressway into a tollway and extended it. Meanwhile, IDOT – which most people don’t realize is a separate agency from the Tollway — has been hobbled by stagnant state and federal motor fuel tax revenues. Lawmakers in Springfield and Washington have refused to consider gas tax increases. So spreading the wealth, so to speak, may be the answer. This would require major legislative action by the Illinois General Assembly, and may be difficult. Or impossible. Last spring, the Democrat-controlled legislature refused to even consider a plan pushed by Republican Gov. Bruce Rauner and IDOT to create managed lanes on the Stevenson Expressway (I-55). This would have put a single, tolled lane in each direction, with cost depending on the level of traffic congestion. 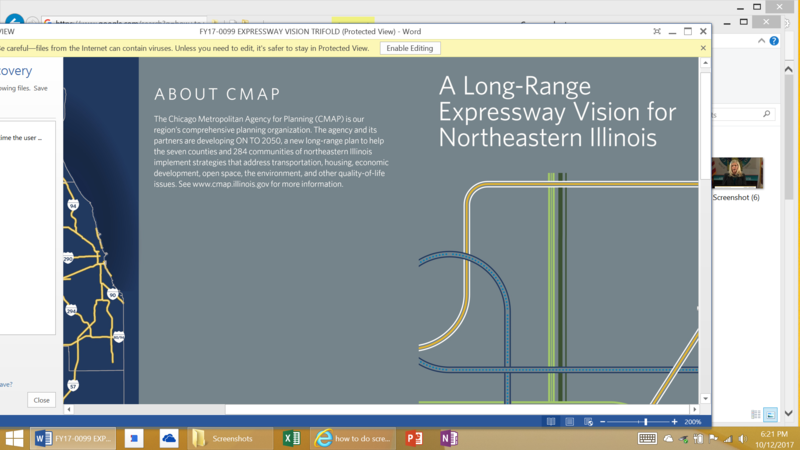 CMAP said it plans to work with IDOT and the Tollway, along with a hired consultant, to develop the vision by mid-2018. Stakeholders and the public will be invited to provide input on the CMAP vision, along with corridor-specific recommendations, officials said.